Have you ever been without toilet paper? It's a horrible sinking feeling. Disgusting scenarios run through your head: should I squabble to safety, should I use what's in the trash, maybe my underwear? It's scary! 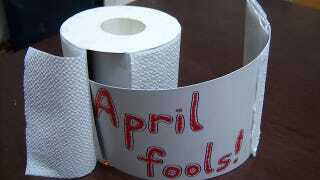 Which is is why I'm going to pull this prank come April Fools.